Rasmus Nielsen worked as a blacksmith in the mining camps near Angels Camp, in the Goldrush Country north of San Francisco. Nielsen is said to have amused himself by getting tattooed in the evenings. Nielsen made the decision to join the show business world, but found the tattooed man slot on the sideshow platform crowded. Instead, he chose to pierce his chest and develop a weight lifting act using those piercings. Another often seen photo shows Nielsen in 1936 in a pose that would become one of his most used - lifting a large anvil with the rings in his chest. Through the years the weight of the anvils changed from 50 to 100 to even 250 pounds. He used this image for many years on his pitch cards. Rasmus Nielsen is known in the sideshow world as a self-made freak. He was not born with any abnormality that would win him this position on the show platform; he had to work at it. A reporter wrote in the 1950s, "Rasmus Nielsen is probably the best example of a man who was determined to make a freak out of himself." The earliest photo of Nielsen in our collection is from the late 1920s or early 1930s showing a full front and back view of Nielsen's tattoos, which include a large Statue of Liberty back piece topped with eagle, shield and flags. Christ heads are seen on his ribs, and his legs carry such designs as a portrait of Bill Cody and California redwood trees. This is not your normal tattoo fare. "Brooklyn" Joe Lieber did much of Nielsen's work. Nielsen's chest was pierced at this point but not as stretched as it was in later photos. In 1940 Nielsen arrived in San Francisco to work at the Golden Gate Exposition for the famous Robert Ripley's Believe it or Not Odditorium. One of the many souvenirs available at that Expo was a beautiful hand tinted linen postcard showing Nielsen doing his famous anvil lift. Often these cards can be found with Nielsen's signature on the back. 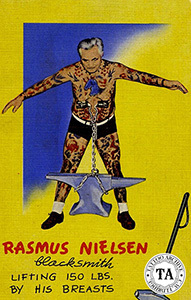 For the next decade Rasmus Nielsen worked as a sideshow attraction. 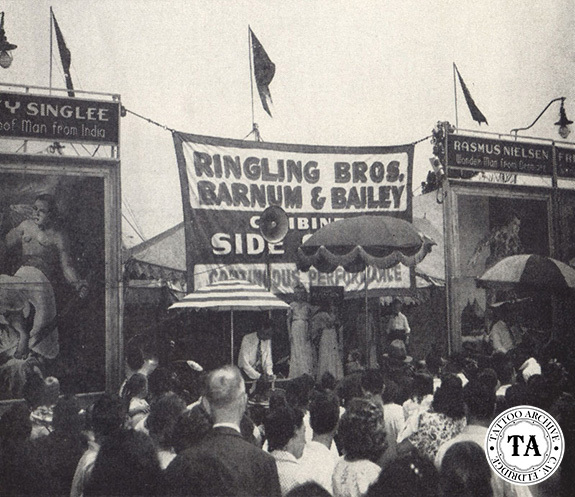 He worked with Ringling Bros. Barnum & Bailey Circus in 1936, again in 1942 and continuing with them until 1948. He was often billed as the "Tattooed Wonderman" or the "Tattooed Strongman." He also did the tongue lift. One of the photos in the Archive is of Nielsen at the annual Calaveras County Frog Jump in Angel's Camp, California. Nielsen is sitting with a group of local miners who are crushing rocks with their bare hands. He is wearing short pants and a short sleeve shirt and seems almost unaware that a picture is being taken. Rasmus Nielsen's history after 1950 is not known, nor is the year of his death.